As the last of the Burbank Police Department’s aging Crown Victoria’s are retired, residents and visitors have become familiar with newly branded Caprice sedans. While on the outside the new sedans look great, on the inside officers have learned to live with a variety of compromises and limitation. According to BPD Sergeant Mark Stohl, the solution has arrived. 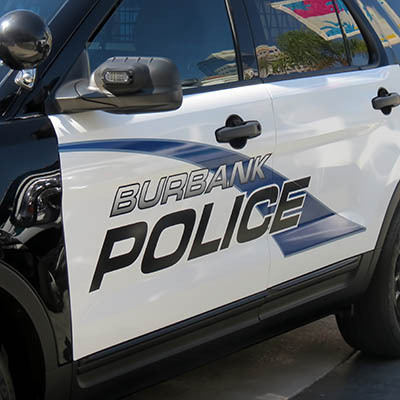 Burbanker’s will now see new Ford Explorer SUVs hitting the street on patrol and responding to police service calls. In fact, the new Explorers have also recently won the “Best Cruiser Vehicle Design” award at the 2014 COPSWEST Expo in Long Beach. Sgt. Stohl, a big guy himself, noted the Caprices had limited space for officers, with the added danger of hitting knees, arms, legs, and other body parts on keyboard, computer displays, and other essential equipment used by all officers. 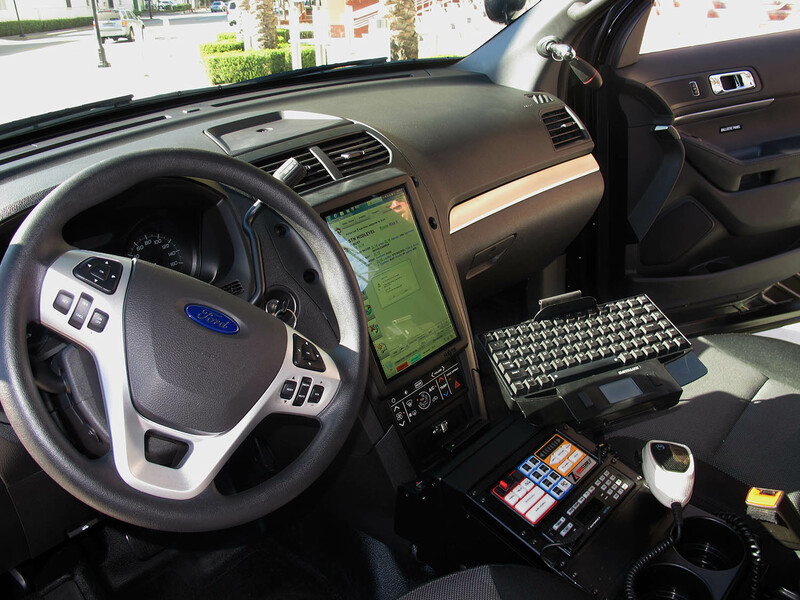 The new Explorers have ample space for officers, including the tall guys, while driving on patrol, or leaving the vehicle quickly while responding to emergencies and incidents. No more worries about snagging equipment belts or other equipment on the way out, or finding ways to remain comfortable while on a long shift. However Sgt. Stohl also explained the new Explorers will also include greatly enhanced IT systems, including an integrated computer display system mounted inside the vehicle’s console – rather than mounted on the “hump.” With a couple of exceptions, including the tactical radio and keyboard, all other IT systems are in the console display. The display is powered by a new HP mini-computer, which is also conveniently mounted in the spare tire space, providing additional space in the cargo hold for equipment. The new Explorers also have enhancements for those getting free ride to the Burbank Jail. The back seats have more space, and in addition the seat belts are planned to allow officers much better control over disruptive or non-compliant passengers. 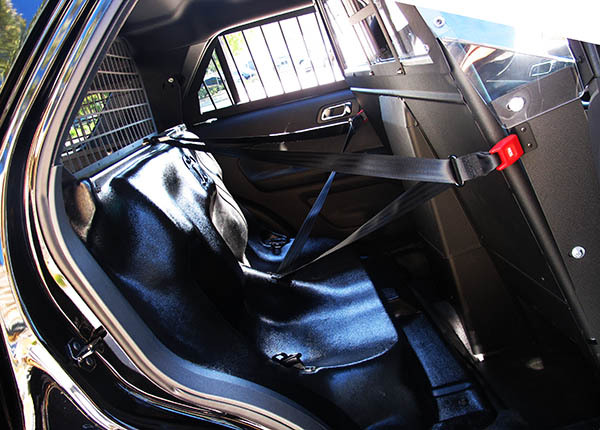 The passenger compartment includes airbags built around the protective cage, providing a safe environment during the short ride to the Police Station. 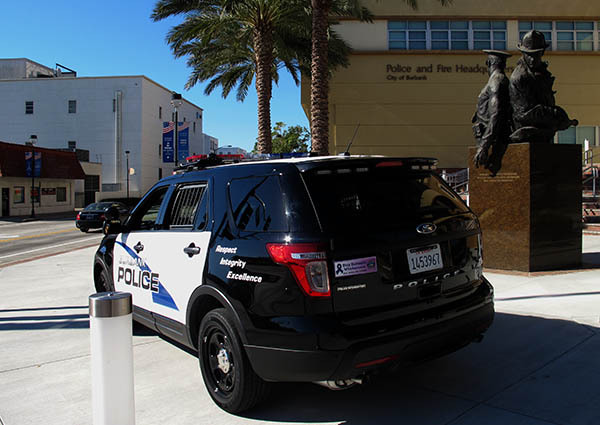 On the outside of new vehicles, officers will have additional protection while on stops with a new set of strobes (red and blues lights) placed on the vehicle’s body. This not only helps protect officers, but also allows drivers to have better visibility when approaching accidents, traffic stops, and other actions. The new vehicles are being configured by Hi Standard Outfitters in Orange, Burbank Public Works, and the city’s Information Technology Team. While each vehicle is slightly more expensive than the current Caprice patrol cars, the Explorers are more efficient, and will cost much less to operate, giving Burbank taxpayers a much better return on their investment in police equipment. 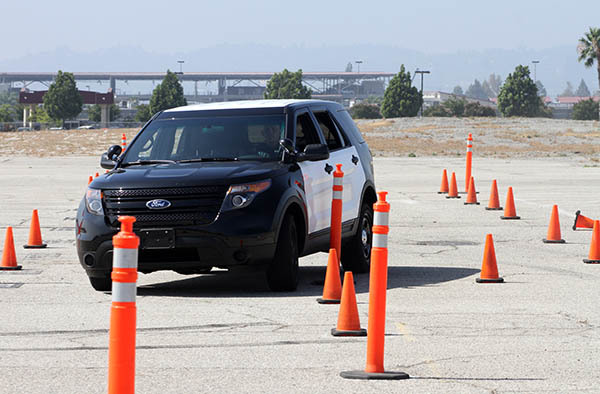 As the new Explorers have a different profile than sedans, including all-wheel-drive, a higher center of gravity, and window visibility, officers require some new driving skills and vehicle awareness. Those skills, as well as pursuit driving in the SUV, are trained and practiced at the Bob Hope Airport. Sgt. Stohl concluded that with luck the new Explorers will replace all of BPD’s patrol vehicles within 3 years. This entry was posted in News, Police, Police and Fire and tagged Burbank Police, Caprice, COPSWEST, Explorer, SUV on November 21, 2014 by John Savageau.